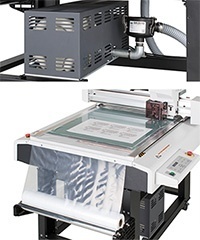 Mimaki CFL-605RT cutter is a 20-inch by 24-inch multifunction, compact flatbed cutting plotter. It supports on-demand production with multiple functions including reciprocating, tangential and eccentric cutting, plus creasing for immediate finishing of packaging and prototypes. With a compact footprint of 52 inches by 41 inches, the CFL-605RT cutting plotter can fit unobtrusively into a design office or studio environment. When combined with an UJF-6042 UV-LED tabletop flatbed printer and packaging design software, this system provides the ability to easily and economically produce package prototypes that accurately reflect the designer’s intent. Conventionally, there are many work processes involved in creating packaging for a product. You might ask an outside contractor to create the package; however, it would take longer to complete the work because of misunderstandings, distance, time differences, etc. The combination of CFL-605RT and UJF-6042* offers a total solution, not only for printing on a product but also for the design and creation of product cushioning and packaging. This combination delivers effective high-mix low-volume production and significantly shortens the lead time for prototype creation and small-lot production by on-demand fabrication. What is the flatbed printer UJF-6042? UJF-6042 is a LED UV curing inkjet printer capable of printing on objects as well as on packaging materials up to A2 size.